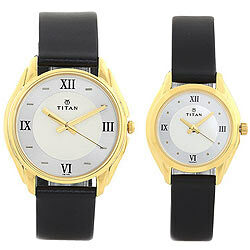 Online delivery of best wishes along with this Elegant Round Dial Pair Watch from Titan for your dear ones. The Watch has a Golden Round Dial in Two tone colour schema and a Black Strap. It is covered by a manufacturers Warranty of 9 months.